Will You Please Consider Doing That Right Now? for delivery on January 22, 2013… the 40th Memorial of Roe V. Wade! the 40th Memorial of Roe v. Wade and the March for Life on the January 25th. Jan. 22, 2013, is the 40th memorial of Roe v. Wade, the 1973 Supreme Court decision legalizing abortion. Now that day has been designated Red Envelope Day as Americans plan to send a visual expression of moral outrage deep into the halls of Congress, beyond the marble columns of the Supreme Court and into the Oval Office. 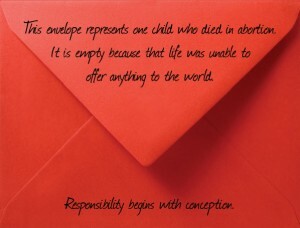 A portion of the proceeds of every red envelope goes directly to organizations committed to the pro-life cause. As WND reported, in 2009 millions of empty red envelopes were delivered directly to the White House. That year, the White House mail office confirmed it received a “deluge” of as many as 2.3 million red envelopes symbolizing the empty promise of lives snuffed out in abortion in a massive campaign that was larger than most White House mailing movements in the previous 35 years. The Red Envelope Day Campaign seeks to meet or exceed the number of empty red envelopes that were sent in 2009. And from that, 100 percent of the net proceeds will be disbursed to pro-life organizations. According to organizers, if 2 million Red Envelope Day envelopes are delivered Jan. 22, it would result in approximately $1 million donated tofrontline pro-life organizations. some of the biggest names in the mainstream media.